For some it is a way of life while for others it is a nightmare. Commonly if you want to do your chores, meet your obligations or in other words take advantage of the day, you need to wake up early in the morning as difficult as this might be. How can you wake up in the morning and beat fatigue or other obstacles? Many people believe that if you sleep early you can get up early. While this is true, sometimes it’s not so simple. The time you go to bed and duration of sleep does matter but it is the activities you do before bed time that affect how easy is to wake up in the morning. To sleep well and wake up better avoid the evening coffee, red wine and chocolate. Scientific research has proven that they can cause insomnia, more than any other food. Also, do not go to bed with a full stomach because it will make digestion more difficult. When you lie in bed try to free up your mind from any stressful thoughts. Your task at this stage is to relax and rest your mind and body. If you have to discuss something with your spouse, do it before going to bed because nagging can also make you lose not only your sleep but also your peace of mind. Make sure you minimize interruptions in the environment in which you sleep, so that there is nothing that can interrupt sleep, e.g. temperature, light, annoying noises. If you’re a fan of fengshui, you can follow their recommendations for the ideal sleeping environment: the bed should be in such a position that when you lie down, you should be looking at the bedroom door, but in such a way as not to prevent the entry and exit of “qi” (the energy that needs to flow without interruptions in the room space). So, you have done your preparation the day before but still when you hear the alarm you find it difficult to get out of bed. What can you do? Drink a glass of water – with an empty stomach a glass of water can boost your energy and metabolism, stimulates and awakens the body completely. Morning exercise – I admit it that this is not an easy thing to do for the majority of people. Those who are doing it have to say that you will be impressed by the euphoria you feel and energy that will have for the rest of the day. Take a cool bath – Use a shower gel that is enriched with tonic flavors, such as citrus fruits-especially after exercise. Skip the coffee for the day – Studies have shown that when the body gets used to caffeine gradually ceases to respond to its effects. In other words drinking caffeine everyday will not wake you up anymore. You should therefore alternate your drinks. Some days you can drink coffee, sometimes tea, and sometimes fresh juice-especially apple juice which is considered ideal for waking you up. Take deep breaths – You can do these once you open your eyes when you’re still in bed. Inhale deeply, so that air can get to your belly. While inhaling fill the joy and energy conquering your body. Positive approach – Even if you wake up to go to work, to deal with your annoying boss and to cope with all the requirements of the day, try to think of something that will bring you joy. A new day has just begun and it’s another opportunity to get closer to your goals. 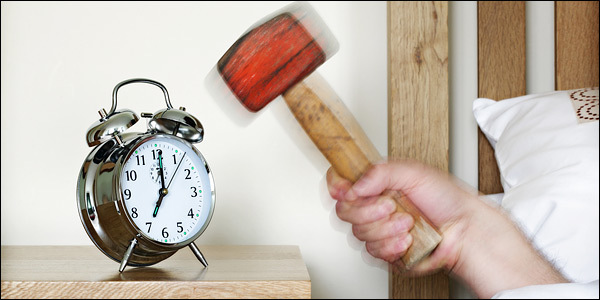 Forget the snooze – Get up as soon as you hear the alarm. Forget the snooze. The only thing you can benefit from a snooze is 5-10 minutes of extra sleep and a bad mood. Scientists from the University of Roehampton gathered 1,100 men and women and recorded their sleep habits, health and lifestyle. Approximately 13% of them used to wake up every day before 7 am in the morning (including weekends and holidays). 6% woke up around 9 am (Monday through Friday) and on weekends they stayed in bed until noon. The other volunteers were somewhere in the middle. As shown by the survey, volunteers who woke up early in the morning had fewer signs of depression and stress and were more likely to eat breakfast, which in many previous studies has been associated with normal body weight. The bottom line is that whoever follows their biological clock and sleeps 7-8 hours at night and wakes up early in the morning, sleeps better and can enjoy a happier and active life. I like how you split it to evening preparation and morning clarity. Both parts are truly crucial, and you indeed can’t wake up early consistently unless you start preparing to it in the evening. Good summary overall and thanks for empowering our brains! Another thing I would add is to disconnect from bright lights/screens within an hour or so of going to bed. This drastically affects the speed at which I fall asleep.